You see it all the time. A professional athlete hurts themselves. It's the exact same injury you have yet the professional athlete is competing again in a matter of days while you suffer for weeks on end. How can that be? The difference is that we take pain killers and just rest while the pro athlete takes more action. Professional athletes are using tools to help them heal quickly. And the reality is that we can too. King Brand makes those tools. We provide them to professional athletes and we can provide them to you too. Elbow injuries and ailments are some of the most persistent conditions many people are faced with. Whether its due to a sudden trauma or the result of repetitive strain, once damaged, the elbow can be incredibly resistant to healing. Patients with elbow issues rarely take the time necessary to rest their elbow so it can heal completely. For medical professionals it is impractical to expect the patient to not use an arm for weeks or months while the body heals itself. For elbow injuries a more proactive solution is required. To heal an injured elbow correctly and completely, additional treatment is usually required. In the vast majority of cases, elbow pain is the result of tendon damage which itself may not be painful or immediately noticed by the patient. Typically, after the injury and through ongoing use of the injured tendon, inflammation and pain eventually sets in. Elbow pain may come on slowly and the condition can worsen for weeks or months after the initial damage before the patient seeks medical help. By this time the tendon(s) can be severely inflamed with a very long recovery time if only rest and anti-inflammatories are the prescribed solution. When instructed to rest their elbow, the typical patient will do so - for a little while. But most people's lives don't provide them the ability to stop using their elbow for weeks or months while it heals on its own. This leaves a limited window of time to get results. In the initial few days / weeks following seeking treatment patients will often attempt to rest the injury. During that time, regular treatments with BFST® and ColdCure® therapy devices can maximize the healing process. BFST® (Blood Flow Stimulation Therapy) stimulates blood flow through the affected area while the patient is at rest. This is very important because while at rest, an unaided inflamed elbow can otherwise have seriously impeded blood flow. It is the oxygen and nutrient rich blood that enables the healing process, so adequate blood flow is required for the tendon to heal properly and quickly. King Brand Healthcare BFST® devices actually serve 3 very important functions. The promotion of blood flow has obvious benefits. The reminder of the injury though is incredibly important too because avoiding re-injury is fundamental to rapid recovery. The BFST® device is designed to be worn even when turned off to help protect the elbow from re-injury and this goes a long way towards shortening the recovery time. Patients enjoy the support BFST® wraps provide the joint and appreciate that they are healing - patients like wearing them, they know its helping them heal. This positive attitude further contributes to an overall positive recovery plan. While promoting blood flow at rest is fundamental to rapid recovery, controlling inflammation and pain are also very important for treating elbow conditions. And for dealing with swelling and elbow pain, nothing works better than cold compression. Unfortunately and particularly when treating the elbow, ice packs are an undesirable solution. Ice packs by nature are too cold - they can freeze the skin causing severe damage. What's more, because the skin over the elbow is so thin with little to no fat for insulation, ice packs can easily freeze tissue below the skin resulting in further damage to the injured area. This can make a bad situation worse. NSAIDs (Ibuprofen, ASA, Acetaminophen, etc) are undesirable options because they are known to interfere with blood function such as clotting and proper blood function is fundamental to healing. The most suitable solution is cold (not ice) compression. ColdCure® compression wraps provide this solution. ColdCure® technology was developed specifically to address the need for a cold compression device that does not freeze the skin and underlying tissue. As a result, ColdCure® therapy can be applied for extended periods of time providing superior relief from swelling and pain. As well, ColdCure® wraps carry the same benefits as BFST® wraps in that they provide additional support and protection to the injured area and serve to remind the patient that they are getting better. The BFST® (Blood Flow Stimulation Therapy) Wrap is designed to promote blood flow in injured tissue below the dermal (fat and skin) layer. Utilizing our patented Energy Web®, specially controlled EMR energy envelops the affected body part and stimulates blood flow in the soft tissue deep beneath the skin. The resulting blood flow brings oxygen and nutrient rich blood to the injured area accelerating the healing process. As an FDA Registered Medical Device the BFST® wrap is suitable for use in hospital and therapeutic clinics. Because the device is completely safe for patients to use themselves, the BFST® wraps can also be used by the patients at home. Home use reduces in-clinic medical costs and further speeds up healing times. 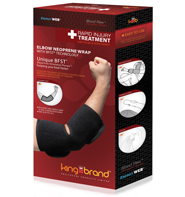 The Energy Web® used in BFST® elbow therapy is enclosed in a soft, comfortable neoprene wrap. The wrap shapes the energy web to mold around the complex form of the elbow to ensure that there is an even distribution of energy over the entire injured area. The wrap is opened and closed using attached Velcro straps that guarantee a perfect fit. As well, the wrap and unwrap design allows for easy wrapping of a tender injured joint without having to slip into or out of a tube shaped device. After treatment, the wrap does not need to be removed. After treatment the straps can be further tightened to provide snug support and protection for the injured joint. The device disconnects at the wrap from the power supply and controller so that the user is free to move about the treatment clinic or home when not receiving treatment while still wearing the wrap for support and comfort. The device is incredibly comfortable to wear. Cold compression wraps are standard medical products for the treatment of elbow pain and inflammation. Cold and compression applied to an injured elbow immediately reduces the risk of further damage from excessive swelling. 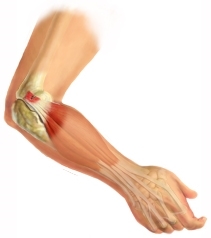 This swelling can be in the muscles, ligaments, tendons, or tendon sheaths within the arm. Doctors and Therapists agree that controlling swelling is a fundamental part of reducing long term permanent damage as a result of a soft tissue injury. The King Brand ColdCure® Elbow Wrap is a medical grade cold compression wrap designed for use in hospitals and injury therapy clinics. Because of the benefits of regular use, patients are commonly treating themselves at home and getting even better results. The ColdCure® wrap exceeds all government and health agency regulatory requirements for cold therapy specifically for use in soft tissue injuries. Most importantly, ColdCure® technology won't burn the skin and underlying tissue which is particularly important when treating elbow conditions. Improving on the RICE standard of injury care, ColdCure® wraps are specifically designed to operate at refrigeration (not freezer) temperatures. This eliminates the potential of skin damage during treatment associated with all freezer wraps. This improved standard is called RCCE® (Rest, Cold, Compression, Elevation). RCCE® allows for the wraps to be applied to the patient and used while not attended by a physician or clinician. This is very important given the likelihood of skin damage from alternative devices which use cold packs charged in a freezer. Elbow injuries should not be treated with regular ice packs. The over-sized cold packs in all ColdCure® wraps contain specially formulated gel with more cooling power per lb than standard wraps. This allows for longer treatment durations without having to recharge the wrap or switch cold packs. The longer treatment times and more cold power means more pain relief, better control of swelling and less handling of the injured area. These all result in a better treatment. Each ColdCure® wrap comes with 3 large cold packs allowing for immediate re-use in clinical settings or the ability for extended treatment durations in the patient's home. Like the BFST® Wraps, ColdCure® Elbow wraps are enclosed in soft, comfortable neoprene shell. The gel pack is specifically designed for the shape of the elbow providing maximum coverage of the tendons below the skin. We do not use one common gel pack in all our wraps - the elbow is shaped very differently from any other body part and each body part deserves a custom designed pack if it's going to work the best. No other wrap in the world has specifically designed cold packs for each and every part of the body. The wrap molds the cold pack around the entire joint to ensure that there is an even distribution of cooling power over the entire injured area. 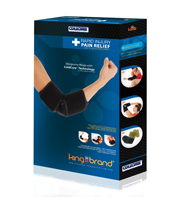 This product has in every way been designed to be 100% an elbow treatment device. The ColdCure® wraps use RigiGel technology so that the gel does not flow away from the injured area when pressure is applied. The gel stays in place even under pressure. Yet it is still soft and molds to the body. ColdCure® wraps are unique and of a higher quality and performance than any other wrap available. Nothing else comes even close. Again, like the BFST® wrap, the ColdCure® wrap is opened and closed using attached Velcro straps that guarantee a perfect fit. The wrap and unwrap design allows for easily applying it around a tender, injured, elbow without having to slip into or out of a sleeve like device. As professional therapists and medical practitioners you know that it is in your best interest to treat your patients quickly and completely. Using regular, alternating, BFST® and ColdCure® treatments your patient will heal quickly and completely with minimal swelling and pain. This ends up in lower treatment costs, greater patient satisfaction and a reduced chance of re-injury. Even with their superior design and performance these devices are low enough priced that they can be used by patients for in-home self treatment which also improves treatment results and patient satisfaction. King Brand soft tissue rehabilitation medical products are the #1 choice by top Athletic Therapists and Medical Practitioners world wide. We provide guaranteed results and customer satisfaction. Like all King Brand products, there simply isn't a better performing option. Note from KB WebMaster - The text below is primarily intended to assist with Google properly classifying this page content. To learn more about our products please visit our website.<br>elbow injuries plague many people. A bad elbow injury causes elbow pain. There are many symptoms of elbow pain caused by elbow injuries. A sore elbow can be helped with elbow exercises although elbow exercises won't cure all elbow injuries. Some elbow injuries require surgery. This heals the injured elbow but the pain in your elbow after surgery can be severe. The best elbow injury treatment is BFST. The best elbow pain treatment is coldcure. Treatment for a elbow injury will cause your elbow pain to improve and your elbow injury to heal. There's no doubt that to heal elbow injuries quickly you need BFST treatments. Coldcure will help with elbow pain. You can cure elbow pain and a elbow injury with BFST and coldcure technology. So, if you want to heal your injured elbow quickly, you need BFST. If you want to treat elbow pain you need coldcure. 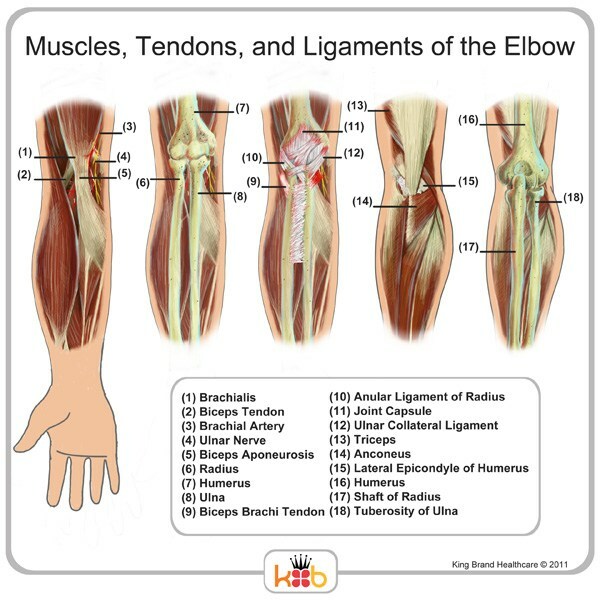 elbow injury symptoms are elbow pain and swelling. These wraps are incredible. They feel comfortable. They work.